Living in Baltimore, MD taught the husband and I a few things. We learned how to rely on public transportation. We discovered how to start over in a new city as a newly married couple. We learned what real crab cakes are supposed to taste like. We learned what The Wire was based on. And we learned about leafy greens. 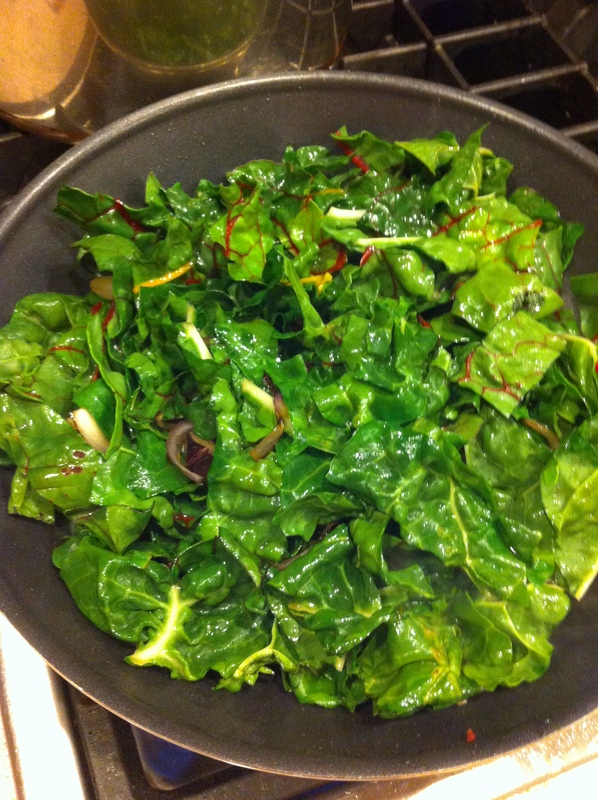 Our leafy greens education began with one decision. We joined One Straw Farm’s CSA in Baltimore. In case you aren’t familiar, CSA stands for community supported agriculture. The basic concept is similar to being a shareholder in a company, but instead of cash dividends, we get food! We pay a lump sum up front, and then every week get our “share” of fruits and vegetables. Fortunately for us, our share was delivered to the cafe in the ground floor of our building, so pick up was almost as easy as possible. I didn’t even need to put on real shoes. Among the pros and cons of being a CSA shareholder is eating seasonally. This is a pro if you want what is freshest and best tasting at that moment. This can be a con when it is early or late in the season and you like variety. Our first few weeks were a crash course of all of the different types of greens that can be grown in cool weather. We experienced collard greens, kale, dinosaur kale, spinach, mustard greens, turnip greens, beet greens, chard, and rainbow chard. I’m sure you can guess the only one of these I had eaten before living in Baltimore. This was a request I could meet. While I don’t long again for daily greens, the husband was right to recommend we bring them back in for star appearances. 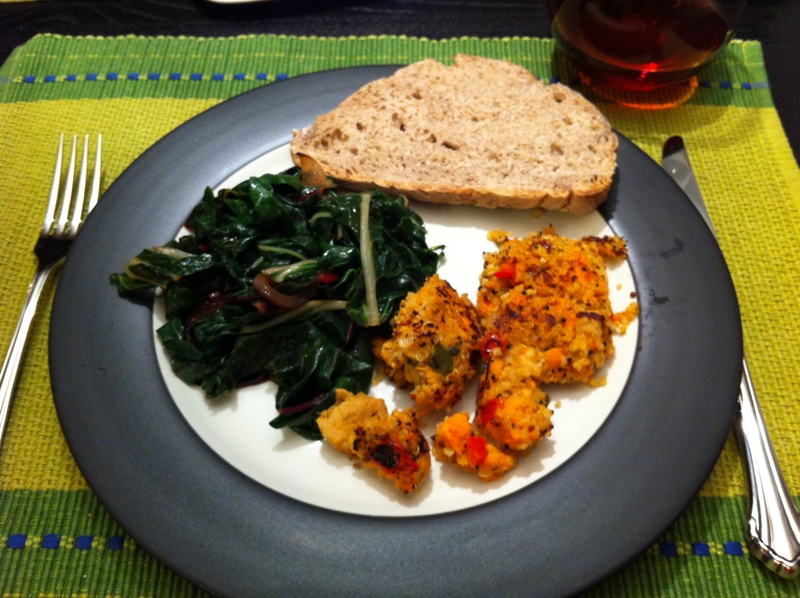 They are simple to make, super healthy, and a nice change of pace from raw salads. They are a perfect addition to round out a Meatless Monday meal. Here’s what I threw together from my Baltimore memories. You can basically interchange any of the greens mentioned above to the basic recipe. Feel free to add garlic or bacon (if you’re a meat-eater). 1. Wash your greens and remove the tough center stems. Roughly chop into strips about 1 inch wide. Slice your red onion. 2. Heat the oil in a large skillet over medium heat. Add the onions and cook for 3-5 minutes. 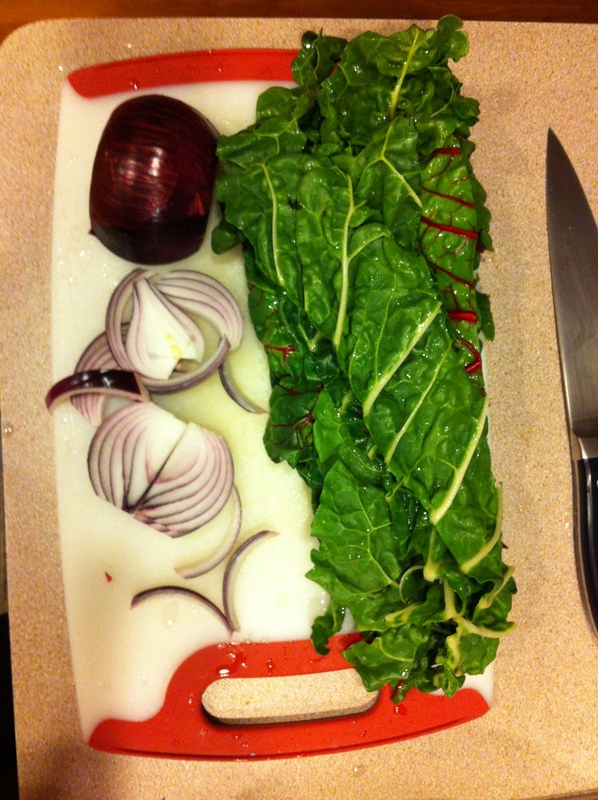 Add the chopped greens and stir with the onions. 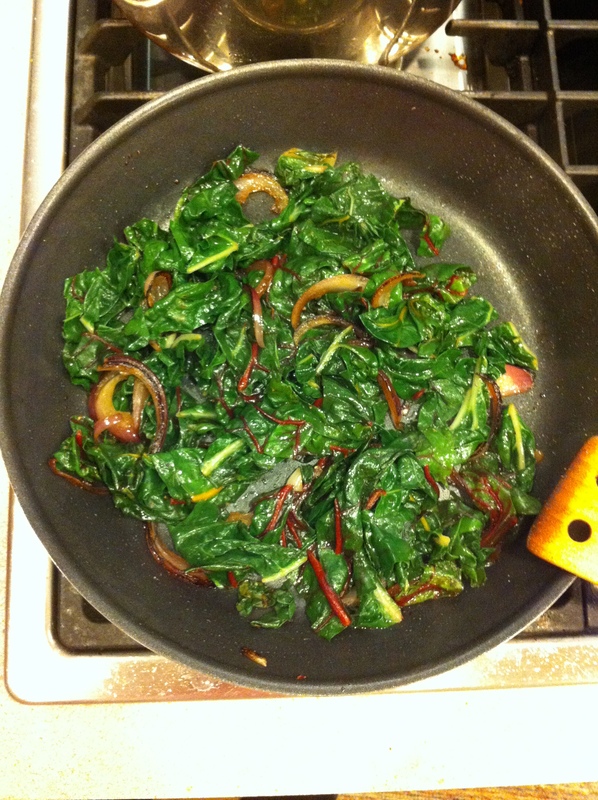 Cover the pan with a lid and let the greens steam for about 5-7 minutes, or until the have wilted and reduced in size. You will notice a substantial volume difference (see photos). 3. Add the balsamic vinegar, season with salt and pepper, and stir until well combined. Serve while hot. One year ago: Zaytinya–My Last Lunch in D.C.